Happy birthday to The Professor! I'm sure somewhere in Middle-earth, Bilbo and Frodo are throwing him a splendid party! Although we usually observe Tolkien's birthday in this forum, I saw on my calendar this morning that today is the anniversary of his death, which occurred in 1971. Rest in peace, Professor. What a loss that was, indeed! 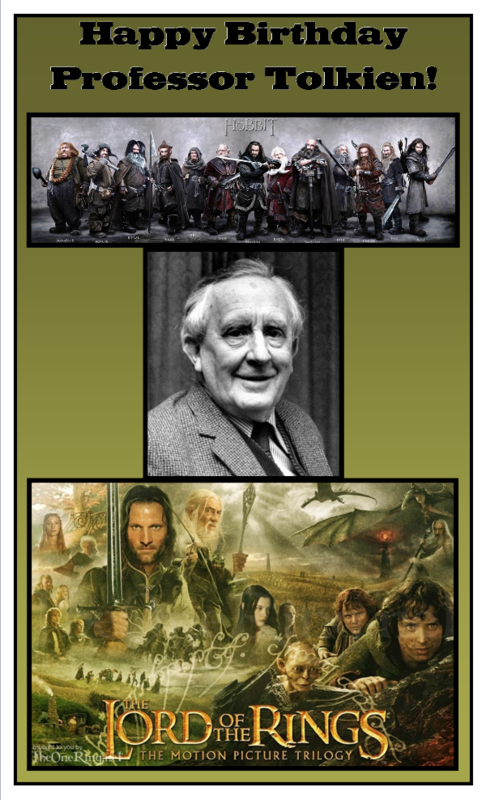 I can't remember where I saw the post and I believe it was you Merry (though I could be wrong) who mentioned that Tolkien's many bouts with ill health were tied to his deep concentration, and long hours devoted to his writing of his lengthy and detailed mythology and stories. I had not heard that before or thought about it much, but undoubtedly it was the case. Well, he was in his early 70s when he died, several years after his wife died. That was probably pretty average life expectancy for the time, don't you think? So I'm not sure that his work practices shortened his life significantly. But I think it probably did cause a difficult quality of life at times. Essentially, he taught full time and also contributed to the war effort by spotting for bombers, etc., during the WW2 years when the bulk of LOTR was written, mostly at night after his family had gone to bed. That had to result in significant loss of sleep in addition to the other privations of wartime. From reading the letters, it seems that his final days were rather happy. His last illness seemed to have taken him in a hurry. He was definitely a great-souled person and driven to complete his masterpiece. But he does say several times in the letters that he would not have been able to complete LOTR if it had not been for Christopher. I think he felt that it was sort of a lifeline to Christopher, who was in the RAF during WW2 and suffering, so the letters imply, from the lack of civilized conversation and companionship. Maybe that's why I'm always more sympathetic than most to Christopher's attempts to protect his father's legacy. I, too, think he would be less than content with 'The Hobbit' movie. Like LOTR, though, parts of it are perfectly done. He would probably feel deeply divided! J'amerais me procurer le livre de Paul H.Kocher , la fiction de JRRTolkien, maître de la Terre du Milieu, mais existe-t-'elle en édition française? It's a long bibliography of Tolkien secondary sources, many of which are in French. That could be fun! Nothing new here, really, but it features John Rhys-Davies and some interesting photos and film. Many people are commemorating the 100th anniversary of the start of WW1 this year, "the war to end all wars".